Ula is a body of devotional Tamil literature that dates back to the Pallava period (275 CE to 897 CE), focused on the veneration of a deity during a temple procession and expressed through the eyes of women. The first part of the ula typically exalts the bedecked idol with its entourage of gods, goddesses, sages and demi gods. In the second half, the deity is described through the seven stages of womanhood: as a playmate, a lover, or one who gives spiritual guidance. 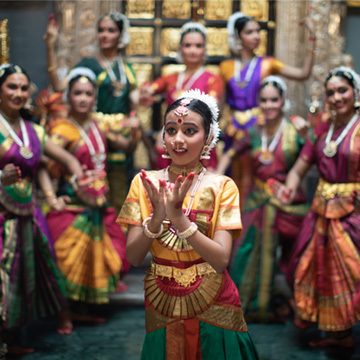 First performed by Anjana Anand in Chennai, this restaging features female dancers of different ages reviving the beautiful ancient literature through bharatanatyam. With music by Bhagavatulu Seetarama Sarma, ULA will transport you back to a time where the temple was the cultural centre of poetry, music and dance.